Capture of video from standard format cameras (PAL / NTSC / RS170 / CCIR) is now established technology, and basic video capture can be achieved with relative ease. Capturing video from larger format or faster cameras, however, requires the application of more specialist knowledge. The main requirement for the imaging system was to capture video from a specialised high-resolution, high frame-rate 12 bit Thales Digital camera. The camera, installed in conjunction with an X-ray image intensifier, was to be synchronised with a high-power, pulsed X-ray source. The maximum required capture speed was to generate data at a rate that was likely to exceed hard-disk access speeds – streaming data direct to disk at this speed could have resulted in video frames being dropped. Two capture modes were thus developed. A fast capture mode grabbed bursts of video direct to host memory, saving to disk once capture was complete. This mode was able to capture video at the full data rate with ease, with the capture period limited only by the amount of host memory available. A second capture mode streamed data direct to disk. Although a lower frame rate was achieved, the period for which video could be captured was limited solely by the available disk space, allowing for image capture over extended periods of time. Above: Screenshot of the high-speed video capture application, showing the user interface and an X-ray image of a "fluidised bed" – an aerated, powdered catalyst used for chemical processing. Electronic circuitry was developed to allow synchronisation of camera trigger with the pulsed X-Ray source – a feed from the X-ray pulse signal being passed through a configurable delay and fed to the camera TTL trigger. Pulsing the high power X-ray source employed allowed the effective duty cycle to be reduced, allowing X-ray to be generated at full power without risking target burn or cooling issues. "Traditional" analogue video systems typically digitise image data to 8 bits per channel – so for a monochrome system, 256 grey levels are represented. The Thales digital camera being utilised generated 12 bit image data – representing 4096 grey levels. This higher dynamic range produces a better image quality but requires special treatment in software. 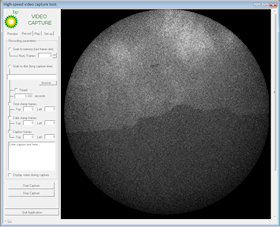 Tools were developed to allow viewing and export of the high bit-depth images, both in full resolution and also in a down-sampled form compatible with the analysis routines already in use. To find out more about the development of high-resolution imaging systems, please contact us.